I recently bought this foundation to try it out. 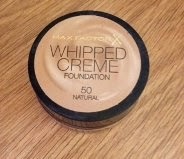 One of my friends told me she uses the max factor whipped creme foundation so I thought I'd give it ago. I bought the shade 50 - Natural as my face has become more tanned due to the luscious summer rays. To begin with, the small pot was a great idea as it is great to carry around with you. The feel on your fingers is like mousse. I don't usually use mousse-like foundations as I feel they are cakey, but this foundation is near the opposite. The foundation is surprisingly light on your skin and hydrating. I feel it would be great on all skin types, but in particular dry skin due to the hydrating element. The product leaves a great coverage, matte but still with a healthy glow. It is being sold in boots for £9.99 at the moment which I think is great value for money.